Pro Tools | Would You Use A Super Wide Seamless Monitor With Pro Tools? Would You Use A Super Wide Seamless Monitor With Pro Tools? 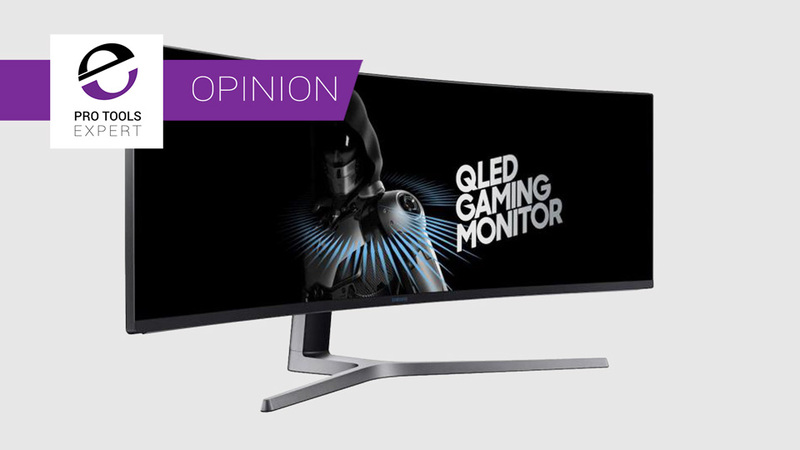 We are starting to see a growth in what are described as super wide seamless monitor screens and we wondered if this was something that would appeal to Pro Tools users. We take a look at the benefits and drawbacks. Not having a break in the middle would be very appealing. I have 2 x 24" 1920x1080 screens in front of me and not having the bezels from both screens interrupting the view would be very appealing. I have read that some people feel that the screen resolution is not as high as for separate monitors. The Samsung 49" screen with a 32:9 aspect ratio is speced with a native resolution of 3840 X 1080 which is not too dissimilar to my existing pair of 1920x1080 screens. Also, I am not a fan of this relentless drive for higher and higher screen resolutions for Pro Tools screens because although you can get more tracks and mix channels on a screen everything gets smaller and smaller. If you are working in stereo, unless you are working very close to the screen and speakers, then the overall width of these shouldn't be a problem. The Samsung one is just under 48" wide so that should work nicely. If like me you have a surround system then you have the challenge of what to do with the centre speaker. I have a PMC monitor system and the tweeters of the left and right speakers are in line with the top of the screens and I have a centre speaker on its side over the top of my existing screens, so one of these screens would work for me. But if you have two screens separated by the centre speaker this will be more of a challenge and probably wouldn't work for you. Please do share your thoughts and observations and we are especially interested in hearing from anyone who has tried one, for audio and/or editing work.